Saboten Hirame (cactus-flounder) is named after its feed, ferment and powdered extract of herbal cactus (saboten) which grow naturally in Jeju, Korea. 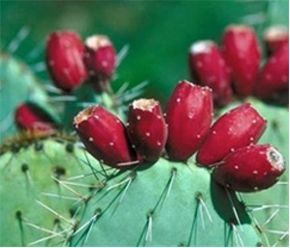 This herbal cactus contains rich polyphenol, flavonoids, beta-glucan, and so on. Moreover, we add dried mugwort in feed that enhances the nutrition more. 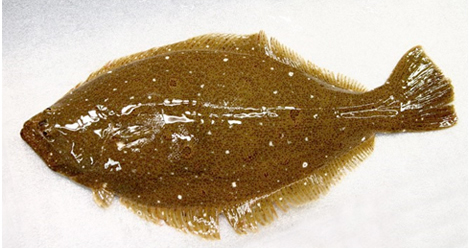 From this, flounder grows so active that both quality and tastes are highly evaluated. In addition, its meat is close to alkaline, which is said to reduce the ‘feed smell’ of farmed fish. Our contracted farmer has HACCP approval, and the safety is promised. What’s the Effect of Herbal Cactus (Reiso-saboten)? Herbal Cactus (Reiso-saboten) is also called palm-sized cactus. This is designated as a natural treasure of Jeju in 1976. It bears fruit every April to May, and its flowers bloom around May to June. The fruit starts growing after the flowers are out of bloom, and ripens into a beautiful purple color from November to December, then those fruits are harvested. This fruit is known to the great effect on alleviate obesity, heart disease, aging prevention, beauty, constipation, diabetes, high blood pressure, liver function improving, hangover, and so on. ・Flavonoid: lowers hypercholesterolemia, and improves heart disease, diabetes and other cardiovascular related chronic diseases. has great quality of meat and taste, and also a health-friendly fish with plolyphenol and Flavonoid. 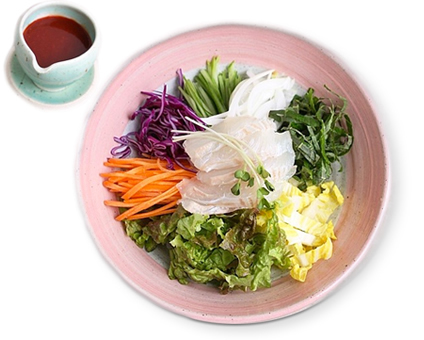 This is a bowl-dish by arranging sashimi of founder and seasonal vegetables beautifully, and seasoned in soy sauce and so on.